So sick of bad days! It's been another awful one for my girl! She didn't sleep much again last night. She dozed off around 11:30 and we immediately went to bed as well. She woke me around 5am making fussing noises. Thankfully she wasn't gagging (I left her g-tube drain on her all night and she was getting pedialyte so maybe that helped). I'm not sure if she ever dozed back off though. Today she hasn't had any throw ups, but this morning she was still retching here and there and she had a serious case of the protruding tongue. When I say her tongue was hanging out nonstop, I literally mean nonstop! And not just sticking out a little, it was usually protruding out so far that she looked like someone trying to impersonate Gene Simmons! So far out that it seemed she might actually choke on it! I've seen her do this at least once before, but it's definitely disturbing. She is SO tired, but for whatever cruel reason, her body is NOT letting her sleep! We did finally get her to doze off at one point (and we were all breathing a sigh of relief), but it only lasted 15min or so and she was back up and fussing to boot! She has been fussy off and on today, again I think it's just that she's so frustrated with her body! She's been rubbing at her nose again until it's a bright shade of red. She gets frustrated when we try to restrain her or prevent her from doing it, but I'm not sure how much more assault her nose can take! Even her left hand is all dry and crackly around her knuckles from putting it in and out of her mouth all day long! Poor thing, she just can't catch a break! This is day 5 of bad days and I tell you what, this is getting old! Only four good days and then five bad days?!?! That's ridiculous! Something has got to give! My girl cannot have more bad than good days! She just can't! It's SO unfair! Please say lots of prayers for her! That she turns this around ASAP! Preferably right this second! Ryan is also having ongoing issues. The bumps on his tummy/legs are fading and they are definitely less red today, but they're fading to a purple color and look almost like bruises (kinda like when Reagan gets mosquito bites). And then this afternoon he had a new bump pop up on his left heel and he would only walk on his toes (only on that foot)! It's like it hurt to walk on it! He seems better now, he's finally putting weight on it, but what the heck?!?! Can we catch a break already?!?! Very annoyed over here and praying for relief and resolution of these issues! See the area just above his pant line...how it's a dark purplish color?!?! What the heck?!?! And he's got a spot on his leg that's doing the same thing! Nausea and hives oh my! Everything is still about the same over here (unfortunately)! Reagan is super nauseous and Ryan is still covered in hives. 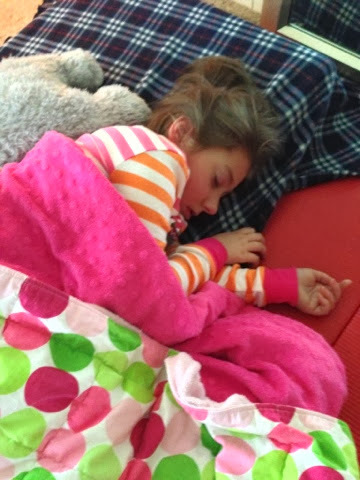 Ryan slept well thanks to the Benadryl, but Reagan was up dealing with the nausea (even with us switching her over pedialyte). She woke me up around 5am with a cough, by the time I jumped from bed and ran in there, she was already soaked in throw up! I had to change her clothes and then I tried giving her clonidine. It didn't do a thing. Finally an hour or so later, I tried Lortab. It made her sleepy, but her body was fighting her. It would NOT let her go GI sleep. She'd close her eyes for a few seconds and then pop back awake. At one point she even started fussing! I think she was just so frustrated! Poor girl! This morning she seemed a little better. Less agitated and less nauseous. Unfortunately it didn't last. This afternoon the nausea came back with a vengeance and we've been battling it all night tonight. Big throw ups! Big! I try draining her g tube but nothing comes out, then she throws up and tons comes up! Ugh! So frustrating!! Poor girl! I really hope this fades and she's able to sleep tonight! Ryan has been a handful unto himself! He's covered in itchy red welts! This morning his hands/knuckles were red and swollen, which had us a little worried! 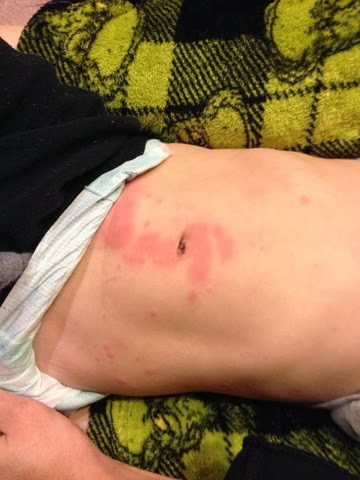 We took him into an after hours clinic that had a pediatrician and both he and our regular pediatrician think its an allergic reaction to something. Could be the antibiotics he was on, could be something he ate...who knows. It just does NOT look good. Poor boy. He's so itchy too! Thankfully the Benadryl really seems to help with the itching and helps him sleep! Too bad we can't give Reagan Benadryl! We've really got to get on top of this nausea as well as finding something to help her sleep! I'm so frustrated for my girl! Please continue to keep both kiddos in your prayers! Reagan woke up crying last night and was not consolable. We tried clonidine...nothing. She did eventually doze back off after a dose of Lortab, but that only lasted an hour or so. When she woke back up I had to move her to her chair. I tried the bean bag chair first but she just flailed around on it fussing the whole time. She seemed to prefer the more upright position of her special tomato chair. She didn't go back to sleep, but she did stop fussing. This morning she was OK, but still very much on edge, having lots of chorea, grinding her teeth, and not liking having her diaper changed. The nausea set in a little later. She had several throw ups in the morning/afternoon, each increasing a little in volume. They were also a little yellowish (usually they're just clear). I tried draining her g-tube but nothing came out except for a bit of air. As this was going on, her brother decided to give us quite a scare! 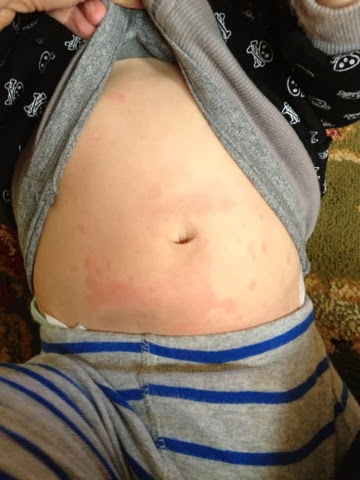 He started developing a rash all over his body! Started in his diaper area, spread to his tummy, under his arms, on his feet and hands, on his knees! It was really bothering him too! He was itching all over and it seemed to be painful! It looked like hives but we can't be certain. We gave him some Benadryl and that seemed to calm him down a lot. He actually dozed off around 6pm...2hrs after he got the Benadryl. We put him in bed and he's been out ever since! (He usually goes to bed around 8-8:30...so that's very early for him!) Reagan's nausea has been relentless tonight. BIG throw ups! I don't even know where it's coming from, I drain her tummy and nothing comes out! We're desperately hoping the clonidine will knock her out so she can sleep it off! Otherwise it's going to be a really loooong night for all of us! Please keep both of our little ones in your prayers!! Reagan woke up several times last night fussing, but I was able to get her back to sleep with the help of medicine. She was still very irritable when she woke up this morning. She did not want to be messed with at all. She didn't want us near her at all (even just giving her medicines upset her) and she really hated diaper changes (thankfully she's back to having a normal amount of pee diapers today). Then around lunch time she dozed off and woke up feeling much better. She no longer seemed to mind us interacting with her but she still wasn't a fan of diaper changes! She was still very tense and having a lot of chorea but her hands and feet are not cold and clammy any more and she seems to be feeling a lot better. Hopefully by tomorrow she'll be even better! I'm hoping she skips the nausea this go round! Please continue to keep her in your prayers! The bad days are back and WAY too soon this time (only 4 good days since her last bad streak)! Reagan slept well last night but woke up this morning with a scowl on her face. She seemed to be having tummy pains that would come in waves all morning but as the day went on they became more constant. She's been holding her pee for days now (only having a couple of wet diapers a day), but after talking with her pediatrician, we're pretty sure it's a poo issue! She's backed up and that's causing her to hold her urine. So I helped her go but it didn't seem to give her much relief. We spoke to her doctor again and he suggested giving her pureed prunes through her tube. So we did that and we also gave her a liquid glycerin (pedialax) suppository. That really did the trick! She immediately relaxed and went and seemed to get major relief! Poor girl! That tummy is always giving her problems! She slept for a while after that but still woke up crying once more. It's been a rough day. Thankfully alternating the clonidine/Lortab seemed to calm her and help her sleep it off. I'm hoping this is just an isolated bad day and that she'll wake up tomorrow feeling much improved. Poor girl! Please say some extra prayers for her! 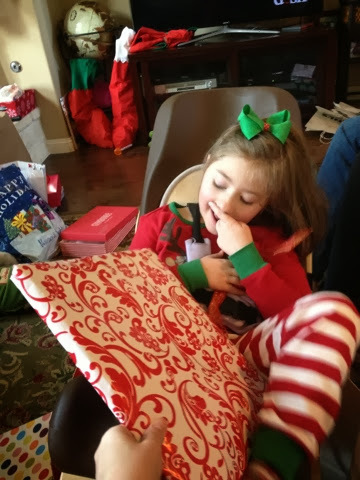 A Merry Christmas for my girl! Reagan slept last night but she was still a little restless (like the night before)! She woke up and was talking a little early for my liking...maybe she was excited about Santa coming?!?! We did stockings shortly after waking up. I wish I would have taken pictures...Santa really goes all out with the stockings! Giant 3-4fts stockings stuffed full with all kinds of gifts and candy! We waited til almost noon to do presents until my sister and her husband (and dogs) arrived. Lots of unwrapping! Reagan got a big foam bean bag chair (not as big as the one from before that was too big, but big enough for her to kick around on)! It's a cordaroy...a very neat concept. We found it online and then later saw it on shark tank! The inner bag can be removed and flattened out as a mattress! It's super comfy and we can even sit in it with her! She also got lots of things for her room, dolls, and clothes. 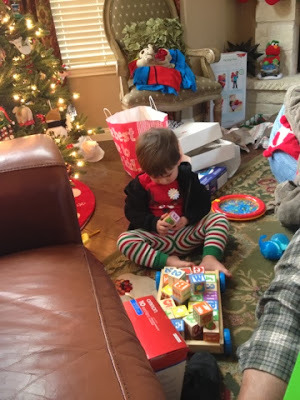 Ryan got plenty of toys and clothes as well! Afterward we played games, took ugly Christmas sweater pics, and then went over to Mikes sister's house for dinner. Reagan stayed behind with grandma, she's been a little sensitive today, but Ryan enjoyed all of the noise and commotion with his cousins! By the time we got home, it was past Ryan's bedtime. We put him to sleep and then we had some snuggle time with our girl! She's been a little sensitive today and keeps getting a sweaty back and cold clammy feet/hands. Still struggling with urine retention and hasn't pooped in days. Not sure when she's gonna sort these things out! Praying for a good nights sleep tonight and so very thankful for a good Christmas for my girl! Reagan slept well last night but woke around 5 or 6am and was not about to go to sleep! She was very vocal, but happy! 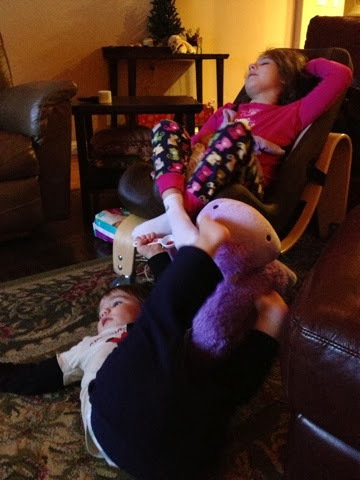 Her brother woke up shortly thereafter and eventually everyone was up! Overall today was another good day. She was smiley and happy but slightly sensitive. A few times she was borderline tears and one time she went over the edge and actually started crying...she eventually settled down, but it took alittle while. Her temperature regulation is off again (cold feet and sweaty back) and she's still clenching both her poos and pees! I'm not quite sure what's going on with her body but we're keeping a close eye! Tonight we had Christnas Eve dinner with my mom and sister and her husband. We're all seriously stuffed! Ryan was a bit of a terror, but Reagan was good. Hoping she has a good one tomorrow! Santa Claus is coming tonight! Sorry for the late post! Busy day! Reagan had another great day today! She woke up smiling and has been smiling ever since! She had one therapy today, speech, and had a really great session! Her therapist is working with her on eyegaze a little more in preparation of her trial of the Tobii eyegaze system in January! I've seen some amazing things with this system so I'm hoping this might be the thing to finally get her "talking"!! We're hoping she'll continue with these good days and give us an extra long good steak this go round! This most recent bad streak really showed us again just how fragile our girl is and that we can't take anything for granted! Just as we start to get comfortable with less bad days and more stability for our girl...POW! We're reminded that there's nothing stable about our life! We started her on neurontin a few days ago in hopes that it will help lessen her bad days. She's taken it before but at a much lower dose. Maybe it will work this go round! Please keep it in your prayers that these good days continue and that we finally get some relief for our girl!! Reagan slept like a rock last night and woke up this morning around 9am just as sweet and smiley as can be!! I can't begin to tell you how happy we are to have our girl back! She's bright eyed and just grinning from ear to ear! She had a great day today, dozed off here and there, but was awake and happy the rest of the day! We were surprised to see her awake...we figured she'd need to sleep a day (or two) to make up for her awful week! Guess not! She's a doll though and I'm beyond thankful that she's feeling so much better! Thank you for all of your prayers! Reagan was up again most (if not all) of the night last night. This morning she still did not want to be messed with. She was very fussy! She was coughy/chokey...I think her throat was at its worst today! (I know what that feels like! Kinda like broken glass!) We were desperate to calm her but nothing was working (there were even talks of a visit to the ER if she didn't improve in the next day or so). She didn't want to be touched or even looked at! We tried clonidine, Lortab, ibuprofen...nothing was giving her much relief! Finally we tried Toradol (at palliative care's recommendation). I gave it to her at 11am and she finally dozed off in her chair at 12:50. That was almost two hours later, so I'm skeptical that it was the medicine, I think something just finally clicked and her body was able to rest! She's been out ever since! We transferred her to bed and she didn't move a muscle! Hopefully she can sleep long enough to let the antibiotics work! Please continue to keep our girl in your prayers! She needs some good restful days! 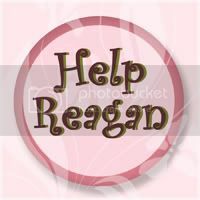 Last night was not any better for Reagan and neither was today! SO frustrating! My girl was still very agitated this morning (of course she was...she hasn't slept since Monday)! Her throat seemed to be bothering her, and since I have had a sore throat for days, we decided to take her and her brother in to get checked out! The pediatrician thinks they both have strep! Ryan's throat looked awful and Reagans wasn't much better! Needless to say, everyone is on antibiotics now! Reagan is SO restless! She can't hold still for a second! She's misrable! We've tried everything...nothing is able to help her relax! We've had to restrain her arm to jerp her from rubbing her nose off! I can't even begin to tell you how upset I am for my girl! This is SO unfair! We need this antibiotic to work and work QUICK! Please say some extra prayers for our girl tonight! She so desperately needs rest! So so SO sick of nausea! Reagan did not sleep well last night. She woke up shortly after we laid her down, but went back to sleep with clonidine. She woke up again around 4am fussing, I tried to settle her down but she was just escalating! Kicking the side of her bed over and over...thankfully it's padded! Finally I had to pick her back up and put her in her chair. She fell back to sleep after some Lortab. This morning she and her brother were both up and at em before I woke up! Reagan was obviously a little nauseous and had a couple throw ups. We decided to attempt to finally get her in for that abdominal ultrasound. It was more sporadic nausea (not nearly as bad as it can get), but it was enough to warrant the ultrasound. We were able to get an appt so we rushed in at 10am. Reagan did really well with it, you could tell she was uncomfortable laying down, but she powered through it and never actually got sick during the procedure. She threw up a couple more times after we got home and never did well with laying down (diaper changes). Tonight she's back in her chair again. I'm going to switch her over to pedialyte tonight just to give her tummy a rest! Hopefully she'll be better by morning! Please keep her in your prayers! 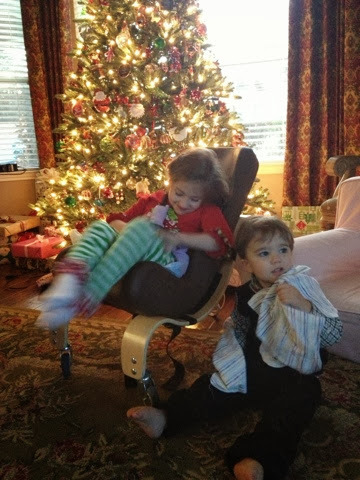 Reagan actually slept fairly well last night (in her chair). She dozed off on her own but woke up around 2am fussing. She fell back to sleep with the help of clonidine and slept the rest of the night. She didn't wake up happy, but she wasn't crying either. All morning she didn't really want to be messed with. She was still very stressed, having lots of chorea, and easily agitated (even crying and holding her breath til she turned purple a few times...totally scaring her nurse). By this afternoon, she was much improved. She didn't mind being picked up and didn't even get annoyed by her loud brother! She was still very tense and would have periods where she'd get wide eyed and zone out, but eventually she dozed off without medication. She's in her bed now...praying she gets a good night's sleep and wakes up feeling much better tomorrow! Reagan did OK last night. No nausea that we know of, but I'm not sure how much she slept either. She's definitely getting back into that phase of restlessness. Her body is a lot more tense too. She was still very sweet and smiley today, but you can tell she's a bit "off". Temperature regulation is way off (hands are like icicles and her back keeps sweating wet), she's holding her urine (only having a couple diapers throughout the entire day), grinding her teeth, very sensitive, and the chorea has picked up as well (lots of kicking and hands in her mouth nonstop). But she's still just as cute and sweet as ever!! I'm hoping and praying she'll settle down and get some good sleep tonight! Thank you for keeping her in your prayers! Reagan did not sleep well last night! She was restless, awake and kicking around a lot, I'm not sure how much (if any) actual sleep she got! She was good though, and she just laid in her bed until I was ready to get up with her this morning. I was very relieved to see her sweet and smiley again today! She had a pretty good day other than being a little sensitive to talking and some nausea that set in this afternoon. She had two throw ups while the nurse was here and then just a couple of false alarms tonight. We were afraid to lay her in her bed tonight so we put her in her chair to keep her more upright. Hopefully she'll sleep this nausea off and not have another Sunday like the last! Please keep her in your prayers! Reagan had another good day today! She slept well but did wake up early this morning making noises, but she eventually went back to sleep! She woke up smiling and has been a good girl again today! Took a little nap this morning, but otherwise was awake all day. Still a little tense/excitable at times...especially with us talking or music on tv...but she held it together. Her hands and feet are nice and toasty...so that's good. Not sure what our weekend is going to look like! She's definitely keeping us on our toes! We have a new nurse working tomorrow...so I sure hope Reagan behaves herself!! 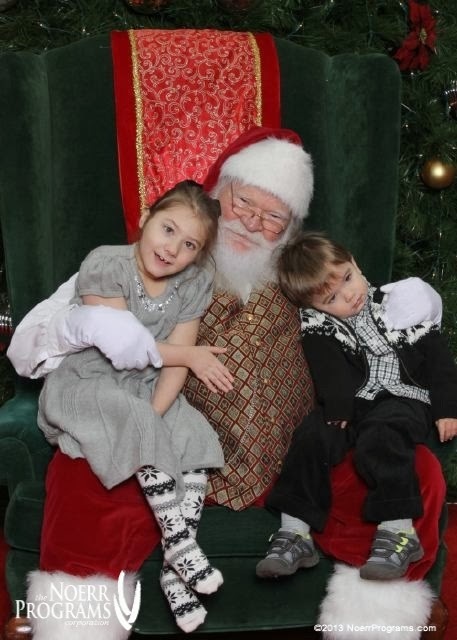 Reagan woke up this morning smiley, so we knew we were on for Santa! She was a little crunchy (with hands in the hair a lot), but she wasn't having much chorea so that's good. She had an early session of PT, which was perhaps one of her best PT sessions yet (with this therapist anyway). She had great head control and was making great eye contact, but she was getting a little vocal at times (especially when we were talking). After therapy we got her and her brother into their "Santa clothes" and then loaded up and headed to the mall! When we got there, there were 5 families in line, so we just got in line to wait. Reagan immediately started getting vocal and kooky and I knew we were in trouble! We put her noise cancelling headphones on and I went to the front and spoke to them about us bypassing the line. They were very nice about it and they got us in right away...talking to Santa and giving him a heads up of the situation. Everyone was great...Santa held her for a bit while we got her brother out (I wasn't sure if he was going to have a major meltdown about going to Santa...he is very clingy with mommy and usually won't go to anyone)! The second I put him on Santa's lap, he melted into him and wouldn't lift his head off his shoulder! He wanted to sleep on Santa! Reagan was a little over excited and Ryan was just the opposite...Santa had his hands full! 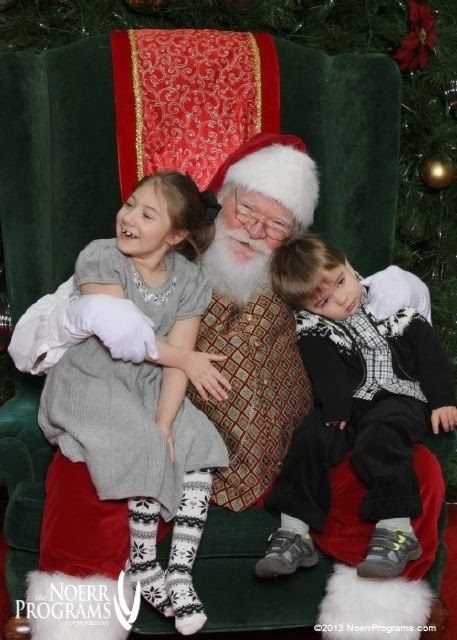 It definitely wasn't my favorite Santa picture...and we may give it another try next week in their other red "Santa outfits"...but they didn't turn out terrible. Reagan had a good rest of her day. She got a little overexcited/agitated at times (and even shed a few tears tonight) but each time she snapped out of it and I really think some tummy pains were causing the discomfort! Tonight she insisted on being held and even though I got nothing done, I enjoyed more snuggle time with my girl! Hoping she'll sleep it off tonight and wake up and give us another good day tomorrow!! 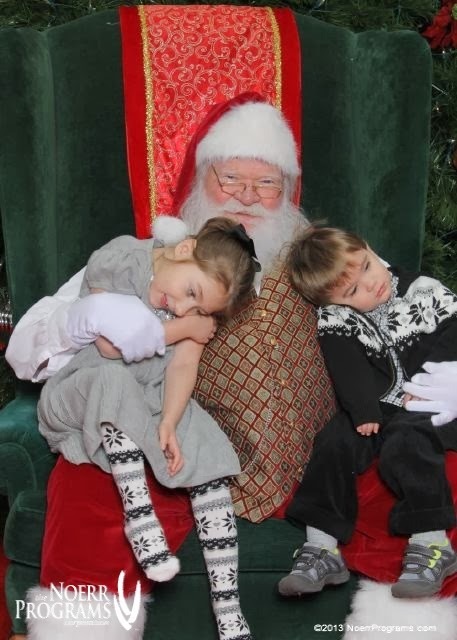 Reagan had a super sleepy day today (so no Santa again)!! We kept thinking maybe she would wake up...she'd move around and stretch...but she never opened her eyes even once! We changed her diaper...nothing! And then right around 4pm, she woke up smiling! Just in time for school! She did a great job with that and then she was good all night! She was a little goofy and a little vocal at times, but I just gave her lots of attention and snuggles and she seemed to enjoy it! She eventually dozed off in my arms and was OUT! Such a sweet girl! Hoping she has more good awake time tomorrow so we can finally get over to see Santa!! Reagan had a GREAT day today! She slept in and then woke up on her own around 11am. She has been SO darling. Very sweet and smiley. Still a little coughy at times but I still think her throat is recovering from all of those bad days! Her hands and feet are still a wee bit cold, but not so much clammy, and her back gets a little sweaty at times but not crazy wet. Other than that, she's been 100%! She had vision therapy and OT today and both went really well. 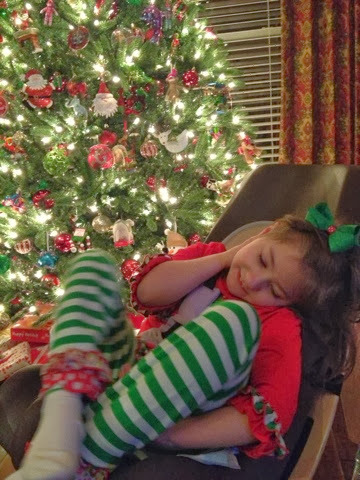 Tonight (after brother went to bed), I got some nice cuddle time with her and we worked on the Christmas tree a bit (just a bit because I couldn't find any of the hooks/hangers)! Holding her tonight, she was so wide eyed and smiley...I wish she could feel this good every day! Definitely thinking Santa tomorrow if she wakes up feeling this good! I'm so sorry for leaving everyone hanging today! I know this is a super late post! 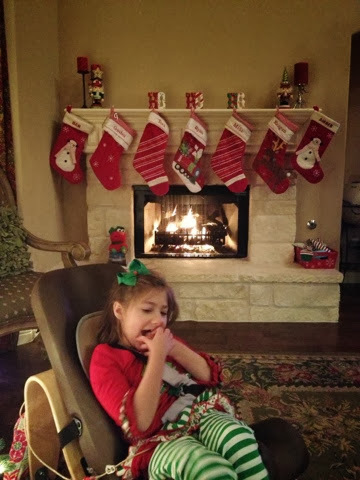 Reagan woke up this morning feeling better (she slept in her chair again). At first we weren't 100% certain that the nausea was gone because she was still a little spitty and coughy here and there, but I think it was just that her throat hurt from all of the crying and throwing up! Poor thing! She did finally give us some laughs, so we knew we were in the clear! As the day went on, she got more and more smiley! She was very laid back (quite the opposite from the last several days) and calm. We finally gave her a bath, it had been nearly a week (but when she's miserable like that, there's no opportunity of doing a bath), but after getting all cleaned up she proceeded to have FIVE (that's right FIVE) dirty diapers! It may be a new record! The first we actually had to help her a little, but the other four came on their own and more and more liquidy! I think it's all from the pedialyte, but who knows! She definitely needed a cleaning out, so I'm glad she got that all out of her system (that could have been part of what was making her so nauseous)! Anywho...SO glad to have our girl back! She was sweet and bright eyed and cuddly tonight and we just snuggled and snuggled! She was a little hesitant to go to sleep...still very laughy (so I gave her a dose of clonidine). That did NOT do the trick and if anything, it made her a little more goofy! I gave her a dose of Lortab and eventually she did drift off to sleep in hew own bed! Sweet dreams my sweet girl! It's been another really awful day for my girl! REALLY awful! She did not sleep much last night. We were up with her off and on all night! She slept very little and the nausea just got worse as the night and the day went on. The gagging and retching turned into full on throwing up...big throw ups and lots of them! It was painful to watch! We all felt helpless. We switched her over to pedialyte, which didn't help the nausea but maybe helped replenish some of what had been coming up. She needed to sleep! Tried clonidine, tried Lortab...nothing would help her sleep! She was exhausted! Her nose was rubbed raw (way redder than yesterday)...Mike figured out a way to strap her arm down tonight so she couldn't rub at it any more! Finally around 10:30pm tonight and what felt like an eternity of nausea, she dozed off on her own! Prayers answered! Now I'm just praying she'll sleep all night and wake up a new girl tomorrow (with no sign of nausea)!! I'm not sure exactly how much Reagan slept last night. She was exhausted but not falling asleep on her own. She did finally doze off (in her chair) after a dose of clonidine, and then we all dozed off! I never heard a peep from her all night but when I woke up this morning, she was wide awake and kicking around (just quiet). That pretty much sums up her day today...quiet but still agitated. Still very tense, lots of chorea, super cold hands/feet, and nauseous...but quiet. Thursday she cried all day, Friday she moaned/whined, and then today even though she was obviously still not feeling well, she was quiet. Poor girl. Tiny improvements each day (except for the addition of nausea today)...baby steps. Hopefully tomorrow will be much better. I'm just hoping she can sleep tonight despite the nausea. I tried giving her Lortab and Clonidine today in hopes of getting her to sleep it off but neither worked in the least! She's still wiping at her face a lot, so her poor little nose is all red again! Like rudolph! Speaking of, I'm still working on my Christmas decorations. With the recent drop in temperatures, I've stopped decorating outside but there's still lots to do inside. We have our tree up but it's still bare. Truthfully I'm afraid what Ryan is going to do to it once it's decorated! Without decorations, he's not paying much attention to it at all. 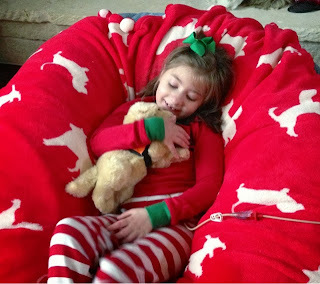 But Reagan has a Christmas tree in her therapy room and he keeps trying to swipe ornaments off it, so it's definitely going to be an ongoing battle! We've got boxes of Christmas decorations sitting in our hall just waiting to be emptied...in my spare time! Hopefully we'll eventually get everything up! Please say some big prayers that my girl turns this around! She needs some sleep and the nausea needs to hit the road! Reagan did not sleep much last night, and the crying continued, so let's just say it was a miserable night for the two of us! She'd doze off for 30min to an hour only to wake back up crying once more! She did NOT want to be held, as she demonstrated by kicking, flailing, and biting when I would pick her up! It literally took all I had to just hang onto her! It's amazing the strength this little girl has! So needless to say, with that kind of night she did not wake up well rested and feeling better! It's been another rotten day for my girl! She's sleeping less than she did yesterday (unfortunately). The chorea is out of control (she can't stop moving for even a second), she's grinding her teeth, and she's been moaning and had this high pitched whine all day. Plus the occasional full blown cry...let me tell you, it's no party over here! Speech came by and actually got her to calm down a little by squeezing things she would put in front of her! OT came too and was able to soothe her enough with steady pressure to her tummy to get her to fall asleep! It didn't last long, but every bit of rest she can get is appreciated. She's definitely better today than yesterday, but not by much! Praying for sleep and a huge turnaround tomorrow! It really is unbearable to watch her suffer like this! It's been an AWFUL day for my girl! Just awful! She slept OK, but woke up squirmy and tense. The crying didn't start immediately, I got up with her before 7, but it was clear she was "off". Right around 9:30am she started crying and then never stopped. She cried nearly every waking moment today. Those miserable, gut wrenching cries (turning purple from holding her breath)...nothing soothed her, nothing took the edge off. We tried Imitrex again (the migraine med), and this time we saw no response (even at double the last dose). We finally resorted to Lortab and that helped a little. She'd doze every now and then but an hour was about the longest stretch. It was a loooong day....and night. She actually got a little worse tonight. She was awake for a longer period of time and very upset. Grabbing and pulling at her hair, biting on her hands (and gnashing her teeth together), kicking and flailing nonstop! After fighting her for hours, I gave her a dose of clonidine and she FINALLY dozed off!! Praying she'll stay asleep and wake up much improved tomorrow!! Today was another surprisingly good day for my girl! She woke up happy once again and we were all very relieved! She was relaxed too, at times to the point where we thought she was going to doze off, but she never did! I guess that's a good thing because she had a busy day of therapy...PT, Speech, & School...and she did really well with everything! We finally got her up in her stander again and she even did great with that (standing in it for over an hour)! It was a busy day, but a good day for my girl. 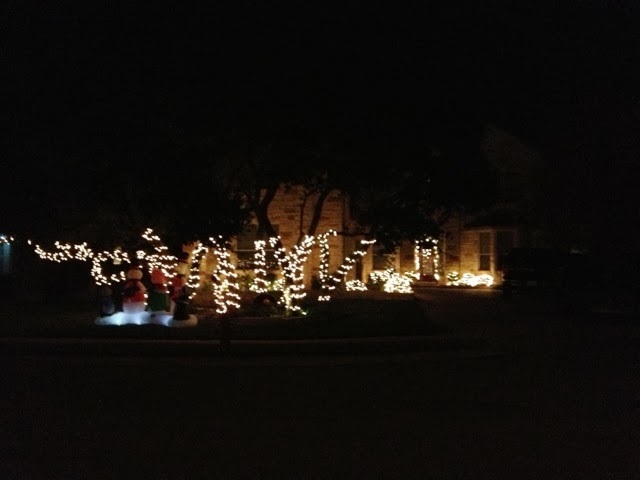 I spent a lot of time in the yard, trying to put more lights out before the cold weather hits tomorrow! It's beginning to look a lot like Christmas! (I LOVE Christmas!!!) Tonight Reagan seemed a little more tense, she was doing the occasional tooth grinding and her body was very rigid. Hoping she can settle down and get some good rest tonight! Tomorrow (and even more so on Friday) it will FEEL at lot more like Christmas!! Reagan slept last night but she was restless. This morning she was really kicking around and squirming in her bed. I'm not sure how well she actually slept. 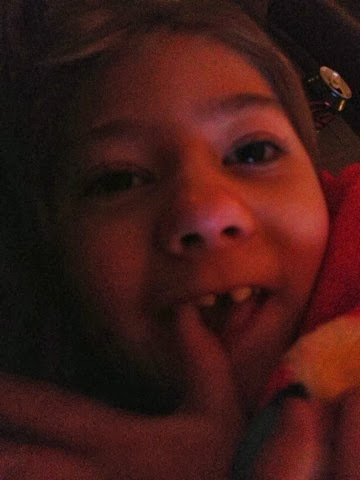 She was doing A LOT of tooth grinding last night (I forgot to mention it in yesterday's post, but she's doing it again now so I just remembered)...it drives me crazy! It really is like nails on a chalkboard! She moves her lower jaw back and forth and grinds her front/side teeth together! Makes me crazy!! Overall today she's definitely been more tense. Still sweet and smiley but very sensitive to sounds and lights. Was not a fan of people talking around her, but OK when talking directly to her! She only had one therapy today, OT, but she did well. Still having issues with her temperature regulation and she's not only refusing to poop but very few pees as well! Tonight she was having little bouts of crazy...something is definitely off with my girl! Hoping she can continue to hold it together. Please keep her in your prayers! Reagan had another good day today. She was still very crunchy with hands in her hair nonstop! She was also very sweaty...especially on her back (definitely some temperature regulation issues going on)! But she sure was super sweet and smiley! Grandma and I made a run to the outlet mall in San Marcos (with brother) to get a dresser/tables for our master bedroom...so unfortunately we did NOT have time to see Santa today! I don't think it was Reagan's best day for Santa anyway because of the crunching! We might have had a hard time getting her to sit up straight so we could see her beautiful face! And that's very important! She also wasn't a huge fan of people talking around her, so that probably wouldn't have been good in a crowded noisy mall! Hopefully we'll be able to find the PERFECT day to take her and get really good pics like last year's!! Praying for more good days for our girl! 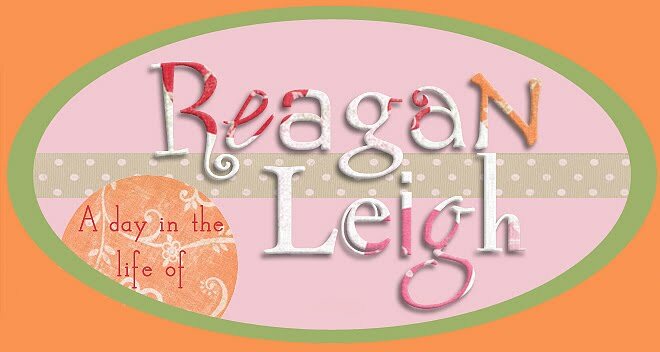 On August 21, 2007 (at exactly 5 months old), Reagan had her first cluster of seizures. She was diagnosed at 6 months old with Infantile Spasms and 2 years later with Mitochondrial Disease. Life has been a roller coaster for us and our baby girl but we've been blessed with wonderful friends and family to help us though this! Zonegran/Zonisamide (9/18/07- 1/7/08)- 150mg/day max dose- reduced number of seizures by half, but also put her in a drugged up state. ACTH (2/19/08-4/7/08)- 7 weeks low dose protocol, 30units/day max dose- no effect/increased spasms?